News: The popular manga about otaku, Genshiken, will be continued as Genshiken II in Japan in Kondasha’s Monthly Afternoon magazine. 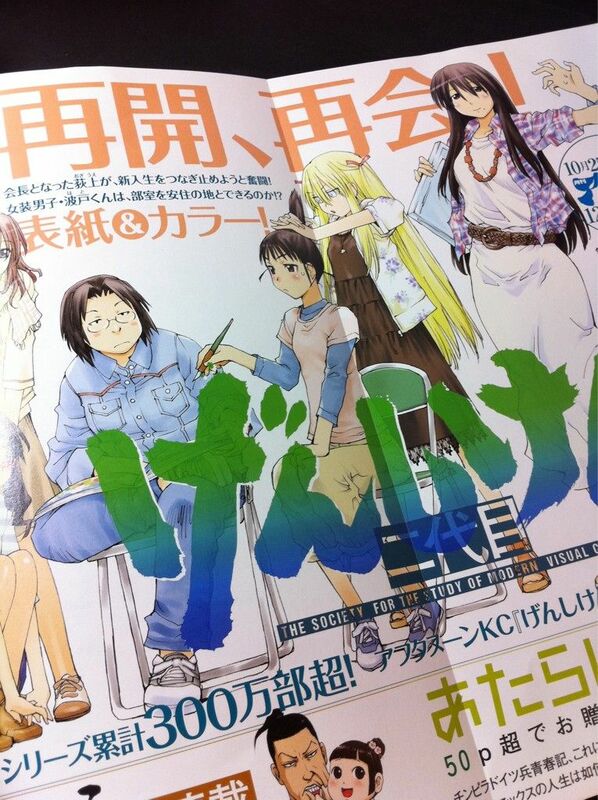 The sequel manga will feature Ogiue, now the Genshiken president, as the main character of the college club. New characters will join in, including a cross-dressing boy named Hato. Views: Genshiken introduced some of the most memorable characters in recent anime/manga history, but seemed to finish fairly conclusively. That said, I’m a fan of sequels, and am hoping to see an extension of characters I’ve grown to love. Ogiue has become a fan favorite as she struggled with personal demons in a cute sort of way. More than that, she is a character whose actions and thoughts reveal profound truths about the human condition. We’ll certainly discuss her on this blog in the future. News: The Ninth Circuit U.S. Court of Appeals struck down two proposed laws meant to prevent minors from accessing “obscene” materials. Considered overly restrictive, the court used Beserk as an example of a work that contained content which wasn’t considered obscene, but would have been restricted through the laws. Views: Censorship is always a touchy issue, made even more troublesome by the fact that the second law struck down was meant to protect minors from pedophiles. Laws or not, protecting minors starts as a social issue. It is at home that parents have the opportunity to instill values meant to protect their children. On another note, Judy Blume was also mentioned in the decision: has any celebrated childrens’ author been on as many banned/restricted book lists as her? Makes me wanna to read some Superfudge. News: Veteran Senator from Vermont, Patrick Leahy, introduced a bill on Monday that would give the U.S. Attorney General considerable power in bringing down sites that infringe on copyright laws, even if the creators of the site are overseas. Views: As we all remember from our Schoolhouse Rock lesson (video below), this bill still has a while to go before becoming a law. That said, this law would be a major development. No manga site wants to have to deal with the federal government. Perhaps this is a marked beginning to a change for viewing habits of manga fans, and that might be a good thing.